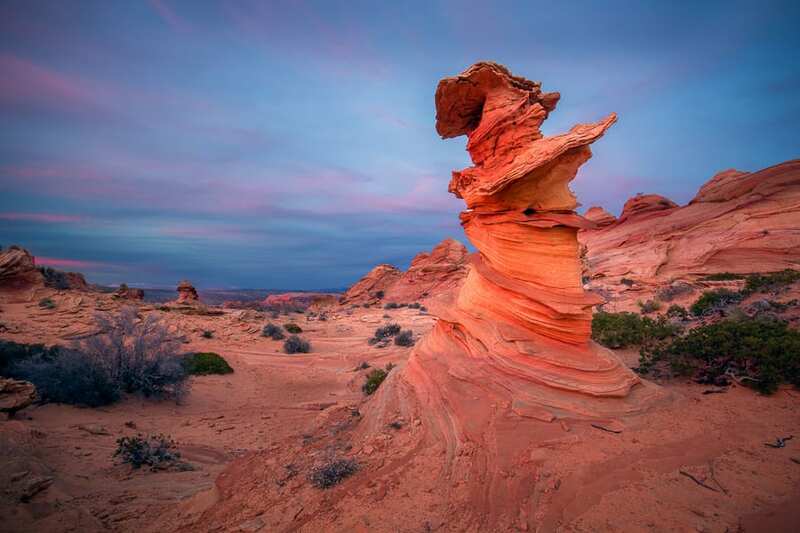 South Coyote Buttes is a fascinating area to photograph. 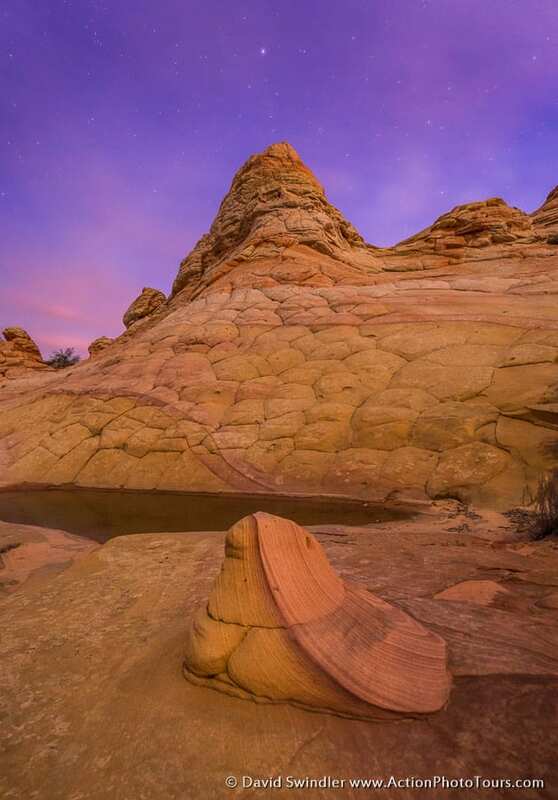 The shot above is a feature often called the Witch’s Hat. I climbed up a little butte to find some nice foreground fins. 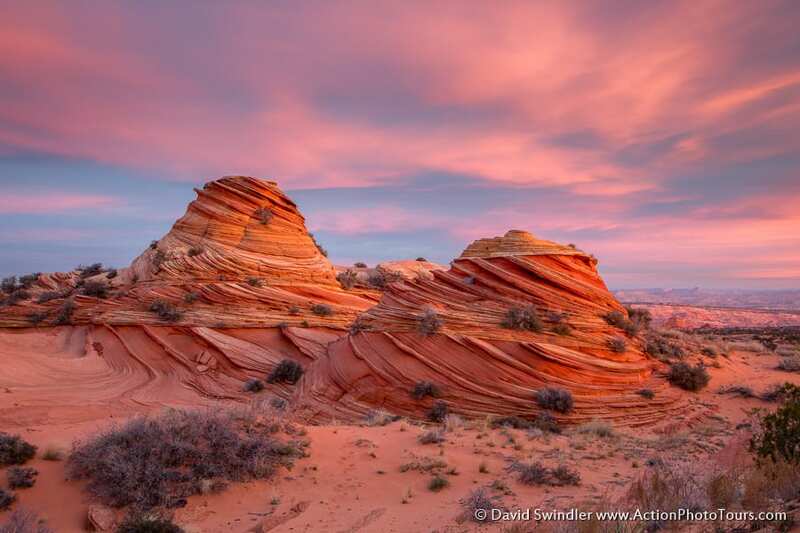 South Coyote Buttes is often overlooked since it lacks many of the “iconic” spots like The Wave in North Coyote Buttes. However, if you’re willing to put in some effort and go exploring, you can take some great shots here! It’s a very large area and would take several days to thoroughly explore. 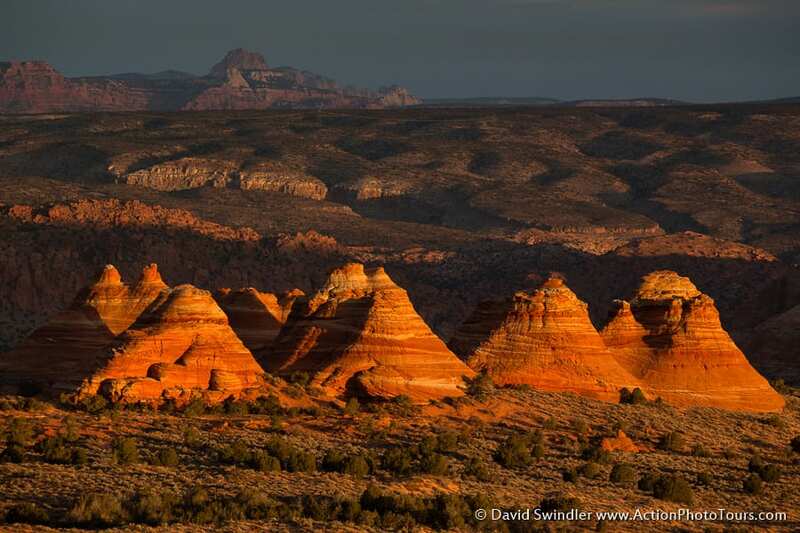 In this article I will just concentrate on the Cottonwood Cove and South Teepees sections. It’s a long drive to Cottonwood Cove over some pretty rough and sandy roads. Beware if you decide to go from Paw Hole directly to Cottonwood Cove, as that section is very sandy and a lot of people get stuck there. It’s better to approach from Corral Valley to the south. 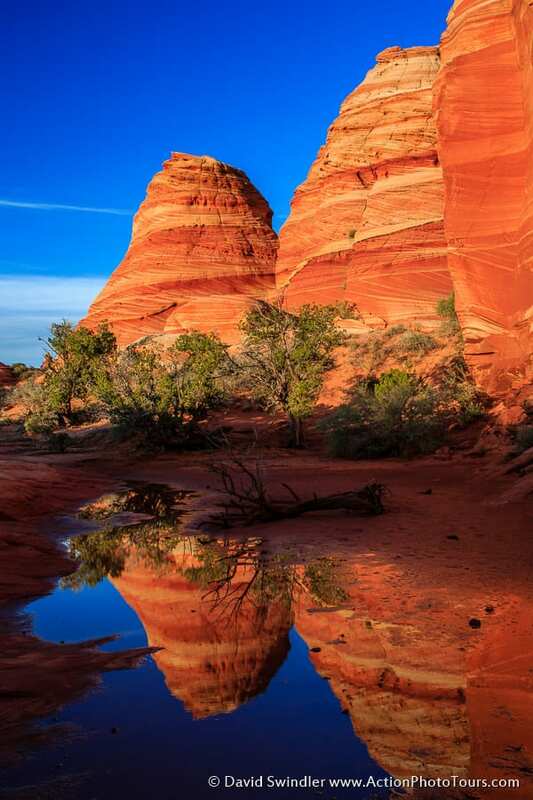 If you book a private photo tour with us, we’ll handle the difficult driving and take you to some of our favorite places in South Coyote Buttes. Learn more here: Read More. I like visiting this area during all seasons, except during the heat of the summer. Even winter can be great when you get nice ice patches like this to add interest to your images. 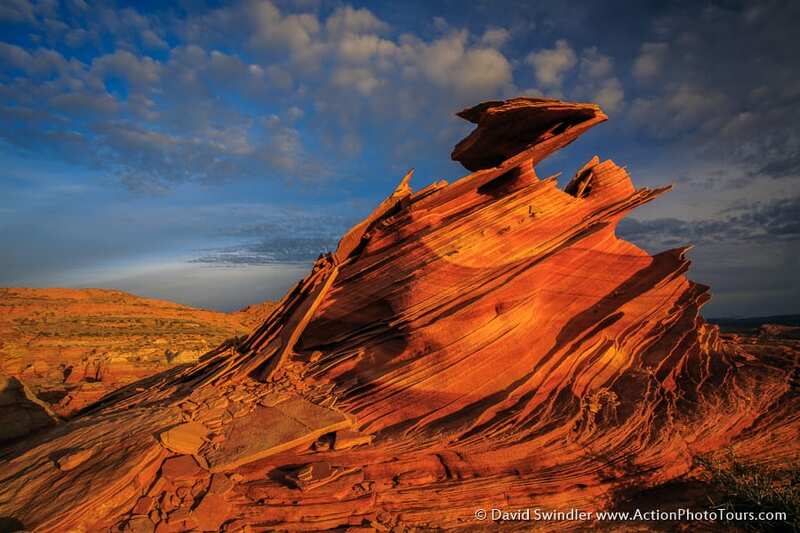 The shot above was taken in the western section of South Coyote Buttes and is rarely visited since it’s a long walk. It can get very cold here in the winter, especially if it’s windy, so dress appropriately! 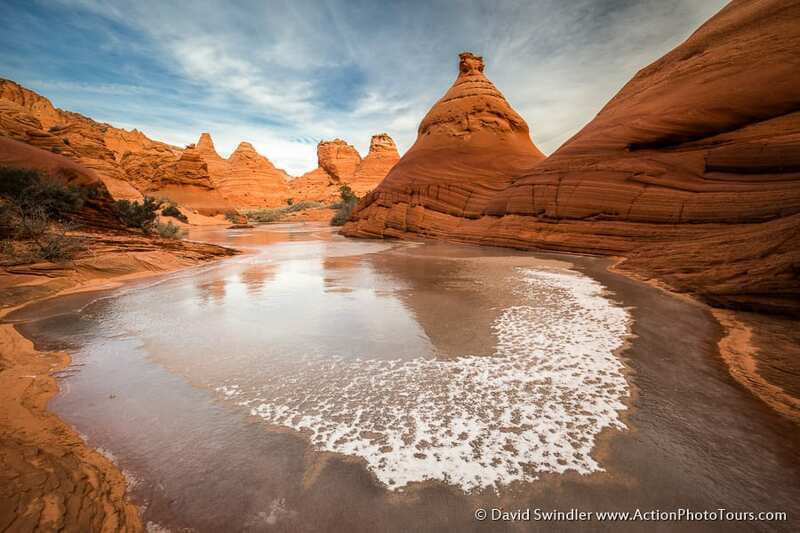 The nice thing about Cottonwood Cove is that you don’t have to hike very far to find some nice features. You can find the Chess Queen formation just east of the parking area. 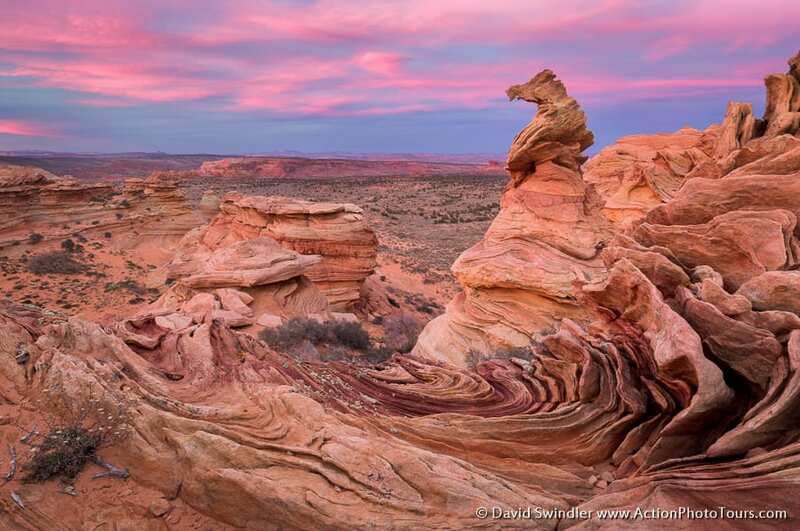 To the west, you can access Twisted Rock, Half and Half, and the Control Tower with just a 2-mile round trip hike. This makes it easy to return to your vehicle during the day, which is especially nice during the heat of the summer. The image above is from Half and Half, taken during the blue hour. The clouds in the sky still had a little color left from the brilliant sunset that evening. The South Teepees can be seen at a distance from the north end of Cottonwood Cove. If you enjoy hiking, it’s well worth the effort to get over to them and you’ll be rewarded with images that not many people get! The image above was taken at 300mm with some nice morning accent light. This shot is a good example of the neat things you can find in the South Teepees. I love the interplay of light, shadows, and leading lines in this image. Sometimes you can even find nice reflecting pools in the South Teepees. They work great when it’s not windy (keep your fingers crossed). The Control Tower is perhaps the most iconic feature in South Coyote Buttes and it gets great light during the winter months (the best views are north-facing). It’s not as big as you might think. 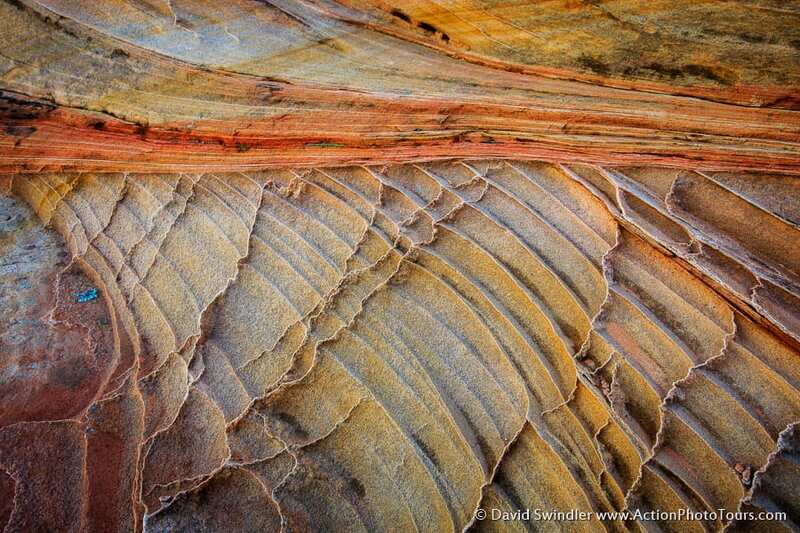 I love the delicate escarpments of sandstone that comprise its structure. It’s also a great spot to do star trails if you’re spending the night. 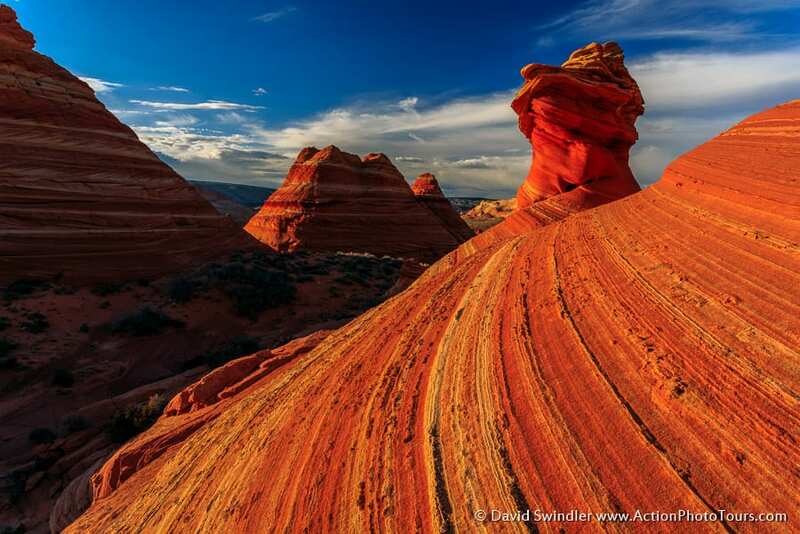 Abstract shots of fins, stripes, ridges, and colors abound in South Coyote Buttes. Don’t get so caught up in the large landscapes screaming for your attention that you miss the little details! 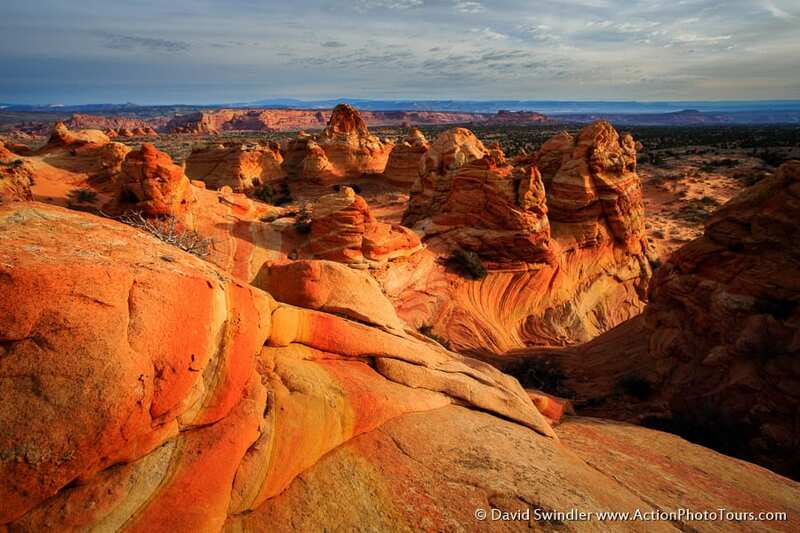 When you get up high, you can see interesting sandstone formations stretching out for long distances before you. Try to scout out areas that look fun to explore and go check them out! Hopefully you’ll be lucky to get some good clouds and sunrise/sunset color. Clear blue skies are obviously not ideal. 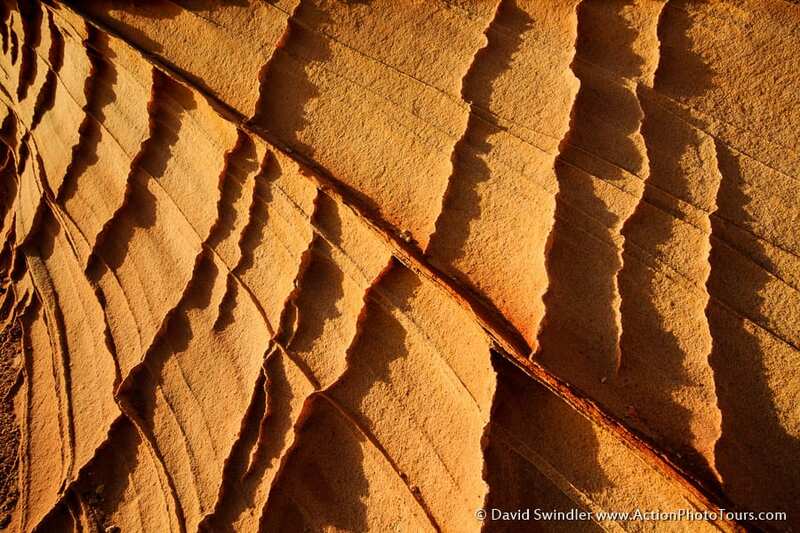 If you have clear skies, focus more on abstract and close-up shots. In the shot above, the sunrise was so intense and it filled the entire sky with color. I found the best shots were facing west to help reduce contrast. 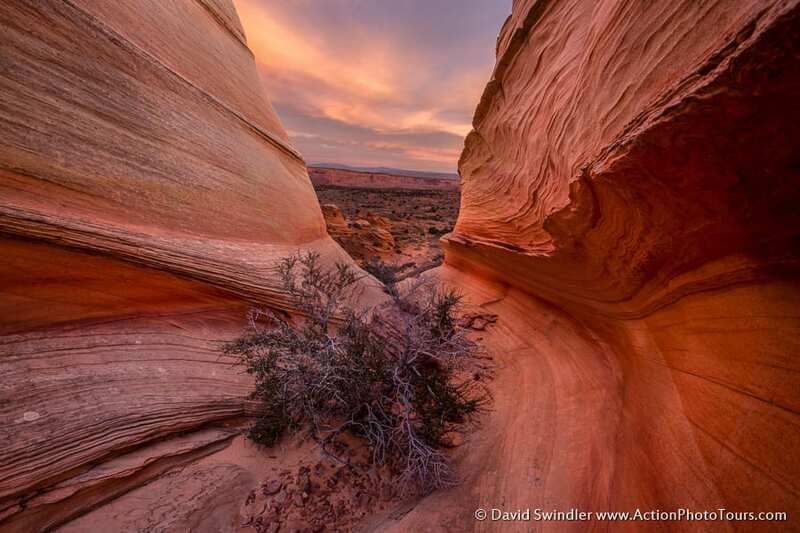 The red cloud color reflected onto the sandstone producing a wonderful glow. If you have clouds, you can get nice shots even in the middle of the day. This photo is very representative of what you can find. 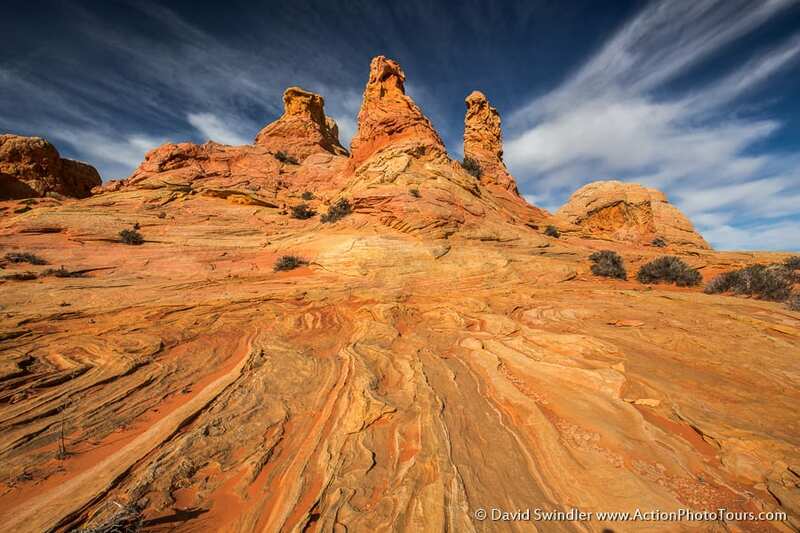 I composed it such that the lines in the clouds and in the sandstone were leading the eye into the background formation. I’ll leave you with this last image of an interesting rock. There is so much to explore here and I’d love to show you this area in more detail on a private tour! Happy exploring.